First developed in the 1930s, the orthotropic steel deck (OSD) system for bridges continues to offer tremendous potential for building efficient and cost-effective modern structures with extended service life. 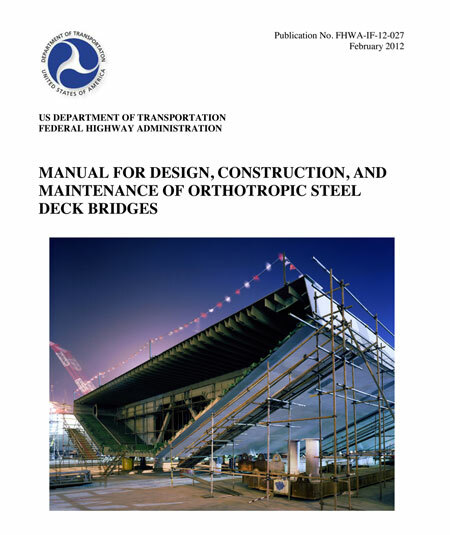 The Federal Highway Administration's (FHWA) new Manual for Design, Construction, and Maintenance of Orthotropic Steel Deck Bridges (Pub. No. FHWA-IF-12-027) presents a comprehensive guide to OSD technology based on worldwide practice and modern analytical techniques. Included are discussion of the many aspects of orthotropic bridge engineering, including analysis, design, detailing, fabrication, testing, inspection, evaluation, and repair. The manual supplements and updates the 1963 Design Manual for Orthotropic Steel Plate Deck Bridges published by the American Institute of Steel Construction. It is based on the recently issued Sixth Edition of the American Association of State Highway and Transportation Officials (AASHTO) Load and Resistance Factor Design (LRFD) Bridge Design Specifications. "Orthotropic steel decks provide a modular, prefabricated design solution that has proven effective in new construction where speed and extended service life are desired, and in rehabilitation of existing bridges where reducing weight is one of the primary goals," said Myint Lwin, Director of FHWA's Office of Bridge Technology. Originally developed in Germany, the OSD system generally consists of a flat, thin steel plate that is stiffened by a series of closely spaced longitudinal ribs and transverse floor beams. As noted in the manual, "the defining characteristic of the OSD bridge is that it results in a nearly all steel superstructure which has the potential (with minimal maintenance) to provide extended service life and standardized modular design, as compared to more conventional bridge construction." Since most of the components are prefabricated and lightweight, OSD bridges can be built quickly. OSD construction also provides a smooth continuous riding surface that has minimal joints, preventing leakage and protecting the other bridge components. Another potential advantage is lower life-cycle costs. Bridges where rapid construction is required. Bridges where extended service life is required. Cold weather conditions where it is difficult to use cast-in-place concrete. The OSD system has been used in thousands of bridges worldwide, particularly in Europe, Asia, and South America. It has not been as widely employed in the United States to date, with an estimated 100 OSD bridges in service across the country. The system has most commonly been used in the United States for particular design conditions, such as for long-span structures where it is paramount to minimize dead load. One example of this design is the new Tacoma Narrows Bridge in Washington. Another use in the United States is for box girder bridges containing slender compressive plate elements that require stiffening, such as the Alfred Zampa Memorial Bridge in California. It has also been used for redecking of major bridges on urban arterials where rapid construction is vital, including the Bronx-Whitestone Bridge in New York City. OSD bridges present unique design challenges, which has contributed to their more limited use in the United States. For example, the design of critical details is controlled less by dead load or ultimate strength but more by live load, meaning that fatigue is the dominant limit state. Early analytical tools were limited in their ability to quantify the stress states at these details, and data was limited on fatigue resistance. After extensive research efforts in recent decades, however, there is better understanding of OSD performance and proper design. And while wearing surfaces applied to OSDs have experienced some problems in the past, including cracking and rutting, recent research and development and general design improvements have addressed the causes of many of these problems. As the manual notes, "current design concepts have proven successful in many modern OSD bridges in the United States and abroad." The manual examines OSD applications, including use of the system for plate girder bridges, box girder bridges, and suspended span bridges. Typical bridge sections and orthotropic panel details are then discussed, as well as structural behavior and analysis. A section on design covers a general design approach and then offers details on such items as permanent loads, live loads, fatigue resistance, and rib-to-deck welds. The section on construction offers instruction on the fabrication process, welding, erection, and inspection and testing. Also covered are inspection, evaluation, and repair, including load rating, limit states, and rehabilitation strategies, as well as wearing surfaces and maintenance and repair techniques. Discussion of testing encompasses experimental testing of decks, fatigue testing of orthotropic steel connection details, and testing of wearing surfaces. The manual culminates with two design examples, showcasing the use of the new AASHTO LRFD Specifications in refined analysis for a multiple girder continuous bridge and a cable-stayed bridge. To download a copy of the manual, visit www.fhwa.dot.gov/bridge/pubs/if12027/if12027.pdf. For more information on OSD bridges, contact Brian M. Kozy in FHWA's Office of Bridge Technology, 202-493-0341 (email: brian.kozy@dot.gov).